Amenities: Entertainment room, spa, gym, sauna. I believe their spa/hot tub, is the only one downtown that is indoors. Other: The Union Square condo complex is very close to City College. Like the most: Union Square condo residents have conveyed to me that they bought here because of the great values. Several compliments where made on the gym and entertainment room facilities. One resident mentioned the added security of being located directly across the street from the police station. Several compliments were made by some of the top floor residents that have their own roof top patio, they like its size and privacy. Like the least: Residents here at Union Square feel they are still a little to far out too walk to most places downtown. 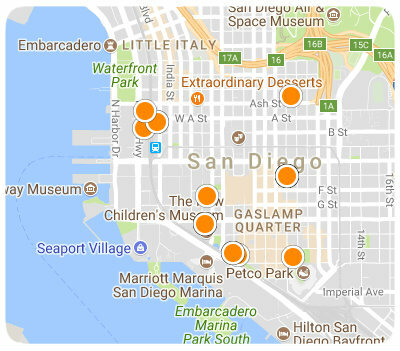 While the distance to the Gaslamp is only 9 blocks, those 9 blocks are very desolate at night, but the area is improving daily.